Your gift helps us to show the truth of abortion to more Americans in more cities. It is by these efforts that the Anti-Choice Project is working to save lives and change hearts and minds. Can you pledge to be a part of it with a one-time gift? Better yet, can you pledge a small, regular monthly donation? 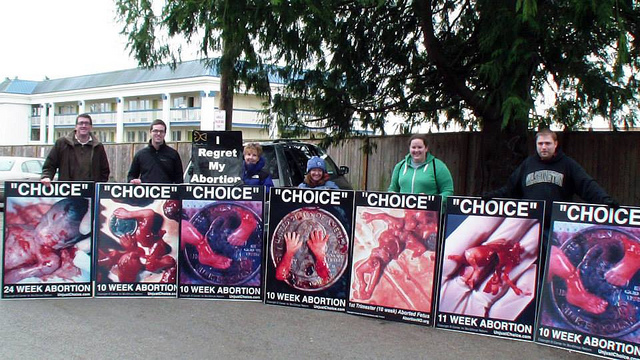 The Anti-Choice Project is a 501(c)(3) non-profit organization (EIN#80-0611658). Your donations are tax deductible to the full extent of the law. View our determination letter from the IRS. Please complete the following form for your donation to be processed through PayPal. Please note a PayPal account is not required for a one-time donation, but is required for a recurring donation. If you do not wish to use PayPal but would like to donate either one-time or recurring, please click here. ACP is an entirely volunteer-based organization, which includes co-directors Andrew St.Hilaire and Tom Herring. That means we run a highly cost effective operation, with very little overhead. This allows us to dedicate the vast majority of our funding toward starting new ACP chapters, by which we can expose the injustice of abortion in a growing list of cities across America, and toward advancing the pro-life cause. Thank you for supporting this life-saving work. Now you can support the ACP when you shop on Amazon! Shop through AmazonSmile and select the Anti-Choice Project as your charity of choice and Amazon will give 0.5% of (nearly) every sale to the ACP. Just look for the “eligible for AmazonSmile” text when you shop.